Hello everyone! 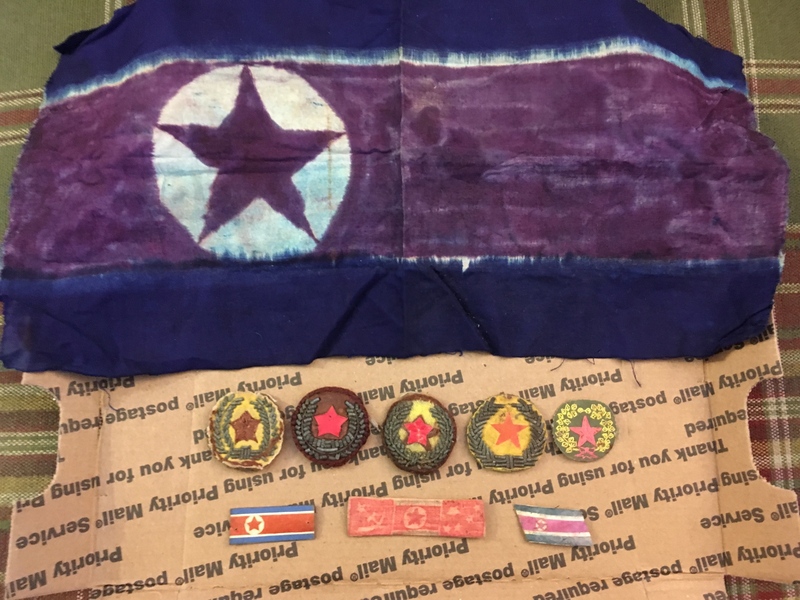 I wanted to share the newest additions from the Korean War to my collection. 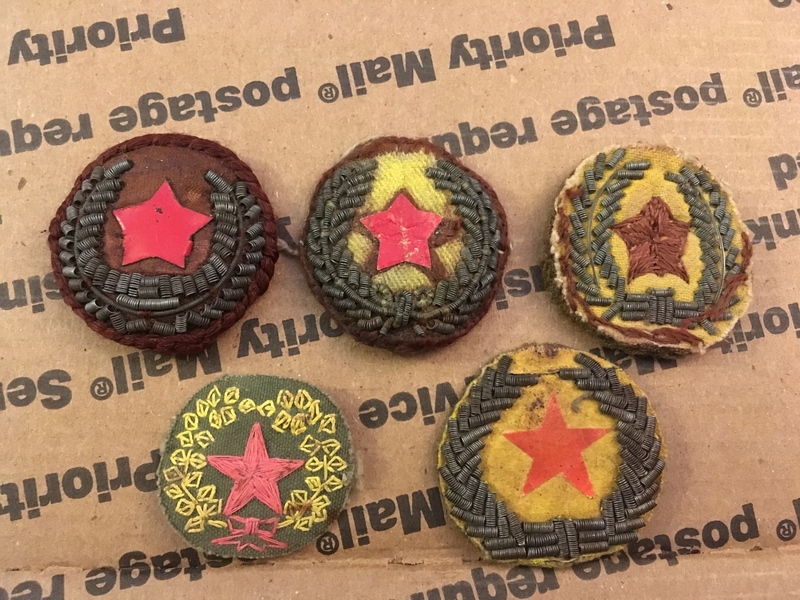 I had the luck to acquire via eBay a North Korean rifle-flag, as well as 5 different NK KPA cap badges, and what I believe are three collar tab devices. The flag is made from silk, and seems to have suffered some moderate bleeding, but otherwise it’s in good condition. 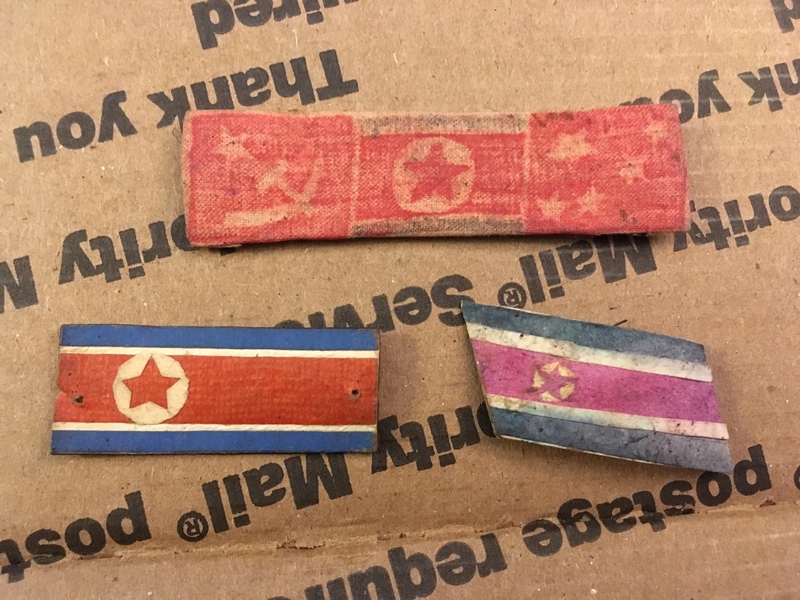 I would love any feedback about the hat badges, as I can’t seem to find any close-up photos of NK headgear from the Korean War. I apologize in advance if the photos are huge (new user and I’m uploading on my phone). I’d also really appreciate feedback about the collar tabs as well, as I’ve never seen them in any period photos. Let me know if anyone would like close-ups or reverse pics. Thanks everyone! Last edited by andrewcousar; 04-10-2019 at 07:07 PM. Wow awesome cap! So what I thought were collar tabs actually went on the chin strap? Were they worn for parade purposes? (as I can’t imagine they’d last for very long in combat). As far as the cap badges go, were there just a plethora of different variations and constructions? I’ve seen a lot of the metal cap badges but the bullion ones seem to be a lot more scarce. Sorry for all the questions, I haven’t been able to dig too much up on Korean War KPA uniform regulations. Thanks again!